A nice tie-in music video from the director of Fright Night, Craig Gillespie has just come my way. it's for Kid Cudi’s new track No One Believes Me. The video is set on the same street as the movie which hits UK cinemas September 2 and features at this year’s Frighfest. 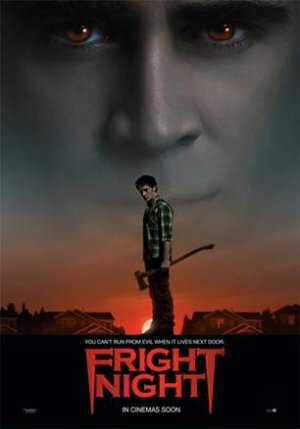 Colin Farrell, Anton Yelchin, Christopher Mintz-Plasse and David Tennant star in Fright Night. Based on the 80s cult comedy-horror classic, it blends thrills, chills and humour into an all-new horror experience... Welcome to Fright Night! High school senior Charlie Brewster (Anton Yelchin) finally has it all – he’s hanging with the cool crowd and dating the hottest girl in school, Amy (Imogen Poots). In fact, he’s so cool he’s even dissing his nerdy best friend Ed (Christopher Mintz-Plasse). But trouble arrives when an intriguing stranger, Jerry (Colin Farrell), moves in next door. He seems like a great guy at first, but there’s something not quite right – yet no one, not even Charley’s mom (Toni Collette), seems to notice! After witnessing some very unusual activity, Charley comes to an unmistakable and terrifying conclusion: Jerry is a vampire. With the help of infamous Las Vegas magician turned vampire-expert Peter Vincent (David Tennant), Charley sets out to uncover the truth and clean up the neighbourhood.